Magellan 3550HSi and Magellan 3450VSi scanners feature large scanning zones for better reading and image indicating. Scanners support Digimark digital watermark and 1D, 2D and Digimarc® Barcodes. Magellan 3550HSi features a sapphire glass scanning window and stainless top. Magellan 3450VSi is equipped with a table/wall mount for attachment. Suitable for point of service environments, units are available with Scanalyzer™ on-screen programming tool and diagnostic reporting. 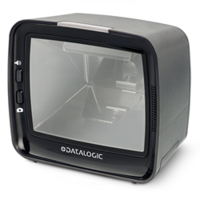 Datalogic, a global leader in automatic data capture and industrial automation markets, introduces the Magellan™ 3550HSi scanner and the Magellan™ 3450VSi scanner, the two newest members of the successful Magellan family of high performance imaging scanners for high-volume point-of-sale. Their advanced digital imaging technology provides industry leading performance on 1D, 2D and Digimarc® Barcodes. These scanners are the only single plane scanners available to support Digimarc digital watermarks which can increase productivity by up to 30% while improving user ergonomics. Their larger, more intuitive scan zones, facilitates high speed sweep and presentation scanning at the POS. The Magellan 3550HSi is a versatile high performing imaging in-counter scanner, available with a sapphire glass scan window and all stainless steel top. It uses the same counter cutout as the Magellan 2300HS and Magellan 3300HSi scanners, allowing for an easy replacement. The premium materials, build quality and flush in-counter design provide high performance data collection in a clean, clutter saving design for retailers. The Magellan 3450VSi scanner is a fully digital on-counter scanner ideally suited for small counter POS environments who want high performance. It features a table/wall mount which makes it easy to attach to the counter or wall or an optional tilting riser stand for placing the scan volume in the most ergonomically correct and secure location. These scanners offer intelligent illumination, providing subtle, adaptive lighting providing user comfort. The 100% LED design is safer and more reliable than laser diode based illumination. Red LED’s provide the best performance on the broadest set of codes. The lighting auto adjusts for cell phones and image capture. They both offer an optional Customer Service Scanner (CSS) that provides a clearly targeted scan zone. This feature allows customers to scan mobile coupons, loyalty cards and gift cards concurrently while the attendant is scanning items, maximizing throughput. Bar code symbologies read by the CSS can be configured independently from the base scanner. The Magellan 3550HSi and 3450VSi scanners are ideally suited for retail point of sale, mobile marketing, age verification and seamless reading of 2D barcodes. Datalogic is a global leader in the automatic data capture and process automation markets, specialized in the designing and production of bar code readers, mobile computers, sensors for detection, measurement and safety, RFID vision and laser marking systems. Datalogic solutions help to increase the efficiency and quality of processes in the Retail, Manufacturing, Transportation & Logistics and Healthcare industries, along the entire value chain. The world's leading players in the four reference industries use Datalogic products, certain of the attention to the customer and of the quality of the products that the Group has been offering for 45 years. Today Datalogic Group, headquartered in Bologna (Italy), employs approximately 2,700 staff worldwide, distributed in 30 countries, with manufacturing and repair facilities in the USA, Brazil, Italy, Slovakia, Hungary and Vietnam. In 2016 Datalogic had a turnover of 576.5 million Euro and invested over 50 million Euros in Research & Development, with an asset of more than 1,200 patents in multiple jurisdictions. Datalogic S.p.A. is listed in the STAR segment of the Italian Stock Exchange since 2001 as DAL.MI. More information about Datalogic at http://www.datalogic.com. Datalogic and the Datalogic logo are registered trademarks of Datalogic S.p.A. in many countries, including the U.S.A. and the EU. Magellan is a registered trademark of Datalogic S.p.A. and/or its affiliates registered in many countries including the U.S.A. and the EU. Scanalyzer is a trademark of Datalogic S.p.A. and/or its affiliates registered in the U.S. Digimarc is a trademark of Digimarc Corporation. All other trademarks and brands are property of their respective owners.